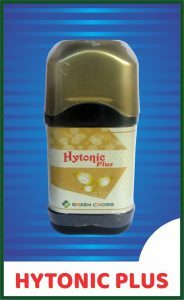 ﻿ Hytonic Plus - Green Cross Agritech Pvt. Ltd.
Hytonic plus is a research product developed by Green cross agritech by use of latest nanotechnology techniques. It helps to make available almost all nutrients plant requires to grow. Trace boron particles in Hytonic plus having almost 1 lakh times smaller particle size moves in to plant systematically and it enhances physiological processes pf plant. Apart from this hytonic plus helps to increase resistance in plants that helps to fight plant against insects and dieases even if they are present on plant. 1.Foliar spray on plants : Take 50 ml Hytonic plus in 15 liter water for foliar application. 2.Soil treatment : Hytonic plus can be applied in soil @ 500-750 ml per acre along with drip or flood irrigation. 3.Seed treatment : Hytonic plus can be used as seed treatment at the time of sowing @ 5-7 ml per kg of seed according to size of seed. Hytonic plus is safe to combine as tank mix with almost agrochemicals used. It also increases the efficiency of tank mix molecules by conveying them systematically in plant.